Secret treasures await deep in the jungle in Exotic Cats, a five by three reel, 243 ways online slot featuring vertical wilds and a host of majestic creatures that will join you on your expedition to big wins. The lion, tiger, panther, leopard and cougar guard the reels and act as symbols in the latest online slot adventure by Microgaming. Look out for: expanding symbols that turn wild on reels 1-5, 3+ scatters to trigger 10 free spin during which landing another 3 scatters will award an additional 5 free spins. 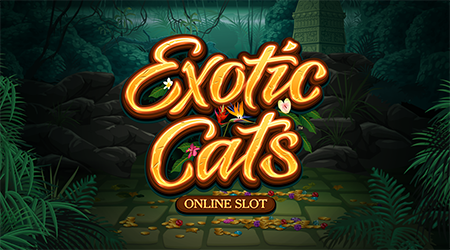 6 comments for "Exotic Cats (Microgaming)"
A new addition to wide range of slots out there. And in some big and known casinos, like bit starz. Although i never play for real these slots, the ones with "243 ways to win"
win any money. Like never. And there are such slots in every casino. Having more pay lines doesnt mean it pays more. Every slot is like that. 243 ways could pay out great and it's even better when you have multiple options on a bonus game like at Thunderstruck II.